The Lotus 49 was designed around the Cosworth DFV engine. Chapman had convinced Ford to build an F1 powerplant. Ultimately the DFV (Dual Four Valve) engine, named 'Dual' because it was designed by mating two 4-valve / 4 cylinder engines together, would power most of the Formula One grid through the 1970s. It was the first successful Formula One car to feature the engine as a stressed member. Taking inspiration from earlier designs, particularly the Lotus 43 and Lotus 38 Indy car, the 49 was the first F1 car to be powered by the now-famous Ford Cosworth DFV engine after . Listen to the 3.0 V8 here. Jim Clark won on the car's debut in 1967, and it would also provide him with the last win of his career in 1968. Graham Hill went on to win that year's title and the car continued winning races until 1970. The 49 was an advanced design in Formula 1 because of its chassis configuration. The specially-designed engine became a stress-bearing structural member bolted to the monocoque at one end and the suspension and gearbox at the other. Since then virtually all Formula 1 cars have been built this way. The 49 was the platform for several new pieces of racing technology. 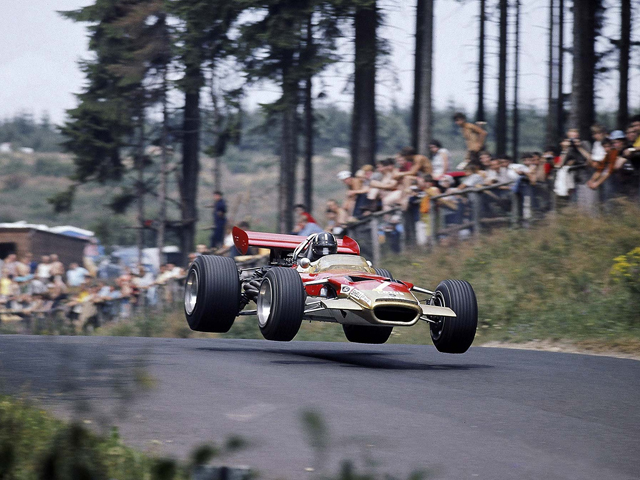 Lotus was the first team to use aerofoil wings, which appeared partway through 1968. Initially these wings were bolted directly to the suspension and were supported by slender struts. The wings were mounted several feet above the chassis of the car for effective use in clean air, however after several broken mounts, which led to near fatal accidents, the high wings were banned and Lotus was forced to mount the wings directly to the bodywork. During testing, Graham Hill found the Lotus 49 easy to drive and responsive, but the power of the Ford engine was initially difficult to handle. The V8 would give sudden bursts of power that concerned Hill. However, Jim Clark won its debut race at Zandvoort with ease and took another 3 wins during the season. Despite the successes, early reliability issues with the DFV ended his championship hopes. 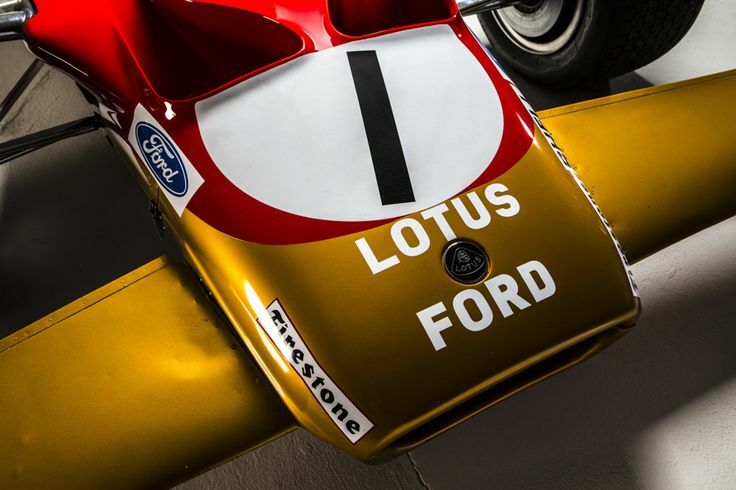 It was largely believed that 1968 would be a better year after Cosworth and Lotus perfected their designs. The season-opening 1968 South African Grand Prix confirmed Lotus' superiority, with Jim Clark and Graham Hill finishing 1–2. It would be Clark's last win. On 7 April 1968 Clark, one of the most successful and popular drivers of all time, was killed at Hockenheim in a non-championship Formula Two event. Graham Hill took over as team leader and won his second World Championship title, after clinching three Grand Prix wins - including the fourth of his five Monaco Grands Prix. Jo Siffert also drove a 49 owned by Rob Walker to win the British Grand Prix at Brands Hatch that year, the last time a car entered by a genuine privateer won a championship Formula 1 race. The season saw two significant innovations. The first was the arrival of unrestricted sponsorship, which the FIA decided to permit that year after the withdrawal of support from automobile related firms like BP, Shell and Firestone. In May the Lotus Formula One team appeared at Jarama in the Red, Gold and White colors of Imperial Tobacco's Gold Leaf brand. The second innovation was the introduction of wings as seen previously on various cars including the Chaparral 2F sports car. Colin Chapman introduced modest front wings and a spoiler on Graham Hill's Lotus 49B at Monaco. Brabham and Ferrari went one better at the Belgian Grand Prix with full width wings mounted on struts high above the driver. Lotus replied with a full width wing directly connected to the rear suspension that required a redesign of suspension wishbones and transmission shafts. Matra then produced a high mounted front wing connected to the front suspension. This last innovation was mostly used during practice as it required a lot of effort from the driver. By the end of the season most teams were using sophisticated wings. The 49 also took Jochen Rindt to his first victory in 1969 at Watkins Glen, New York, before he drove the type to its last win in the 1970 Monaco Grand Prix. The Lotus 63 was intended to replace the 49 midway through 1969. The 63 featured Lotus's attempt at 4WD, but when that car proved to be a failure, an improved version of the 49, the 49C, was pressed into service until a suitable car could be built. Over it's time in F1, the 49 took 12 wins, contributed to 2 driver and constructors' world championships, before it was replaced by the Lotus 72 in 1970.